We keep getting asked what packrafting is. For Tommy, and myself packrafting is chasing those views that seem just out of reach by land, or hidden at the top of a long trail. Those views that put you seemingly right at the foot of mountains that tower over you even hundreds of miles away in the distance. Yeah, those views. We want to be right there, right under them, right in the midst of it all. We are new to this sport, packrafting. Not new to adventuring, but new to taking our adventures by land and water while traveling across North America. We spent the first few months before owning our Kokopelli rafts in the desert in Moab, UT wishing for a way to get out onto the Colorado River to try and beat the heat. We are now two proud owners of Hornet Lite Kokopelli packrafts! We have left the desert and are now in the bear filled, lush, green, and at this moment very rainy, area of Jackson, Wyoming. With us being so new to this sport, we are opting to test the waters (quite literally) on lakes, and slow-moving rivers to start. So, here we are…Grand Teton National Park. We rolled into Grand Teton National Park headed south from Yellowstone National Park. On this route you begin to get closer and closer to the Tetons while getting flashing glimpses of Jackson lake through the trees along the highway. We finally got a clear view of the lake and instantly changed our plans of finding our camp spot for the night to finding the nearest access point to the lake. With little cell service in the area, we just followed the map and stayed close to those roads that hugged the lakeside. And, we found it--a little pebble beach, clear water, and a small boat ramp right at the base of the Tetons. This lake didn’t require packing up the rafts for a hike. We went straight from the RV to the beach to the water. We made sure to find a free campsite close to this area, so we could make it here for sunrise. 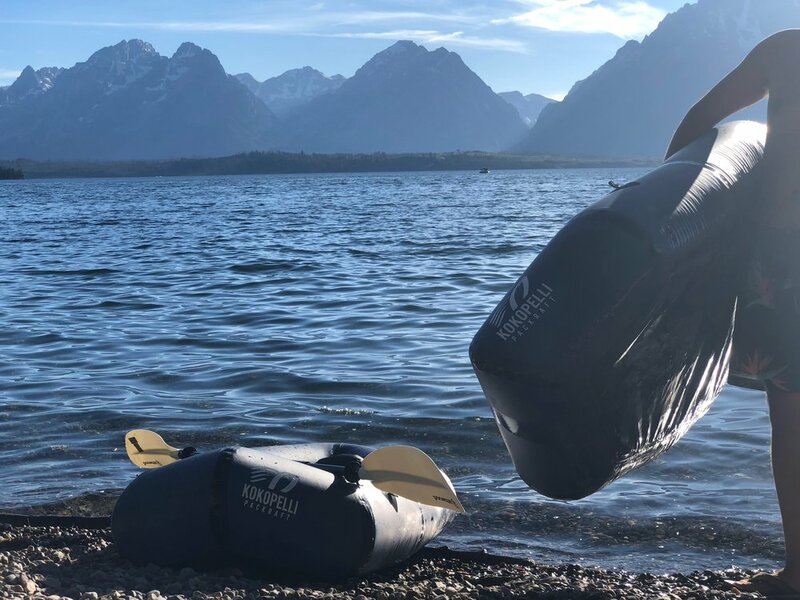 We’d inflate the two rafts the night before, have coffee ready to brew, and get on the lake in time to see the mountain range and lake come to life. I can’t immediately think of a better way to spend a morning. We spent the remainder of the morning island hopping to the small islands on Jackson Lake so the dogs could stretch their legs. We saw a few other small boats and kayaks out on the water that morning. Some were fishing and others were enjoying the quiet view that the lake offers at that hour. We’ve been in transit to new destinations for the last few weeks, which unfortunately doesn’t always give us the most time to seek out hikes in each area we pass through. Entering into the state of Wyoming was just what we needed. It had hikes with amazing views and lakes around every corner. The hike to Phelps Lake was our first time packing the rafts up and hitting the trails with them. The hike to the lake itself is not long at all—maybe just around 2 miles, but you can choose to hike completely around the lake (about 7 miles round trip) where you’ll pass a well-known cliff (or large rock) jumping spot. We do not have large backpacking backpacks. We carry two smaller backpacks on every hike we’ve ever done. Planning to bring the rafts, we fit two of the Hornet Lites in one backpack—I usually carry those, and Tommy carries all of our water, and other essentials, along with our two collapsible paddles sticking out of his pack. We are considering stepping up our game in hiking backpacks, but for now, this is working out perfectly. At our first arrival to the lake, we took the opportunity to break out the rafts and paddle across the lake to the cliff jumping spot instead of continuing on the trail. We were not exactly sure how far of a paddle this was, but let’s just say the “cliff” looked less than a cliff and more like a small boulder from that viewpoint. The water was chilly, had amazing clarity, and the wind headed straight towards us off of Death Canyon. That made the paddle just a little longer than we had anticipated, but it was well worth it. As you paddle across the lake you can see the trail right along the lakeside and you’ll get a glimpse or two of wildlife around the area—no bear sightings although there were several warnings before heading out on this trail. We consider ourselves two fairly in-shape 20-something-year-olds. We don’t hit the gym or anything but we live a mainly outdoor lifestyle and choose to hike, over say, going to a movie. The Delta Hike is listed as a “Hard” trail on a few different trail finding apps we use. At only a 6.9-mile round trip hike, we figured the reviews were exaggerating a bit, or the reviews listed were from people that rarely find themselves on trails. 3.45 miles, a 2,286ft incline, multiple switchbacks, two boulder fields, rock scrambling, and then what seemed like crawling straight up loose soil and tree roots-- and then, you’ve made it to Delta Lake. From the photos we saw online, Delta Lake did not seem to be a big lake. 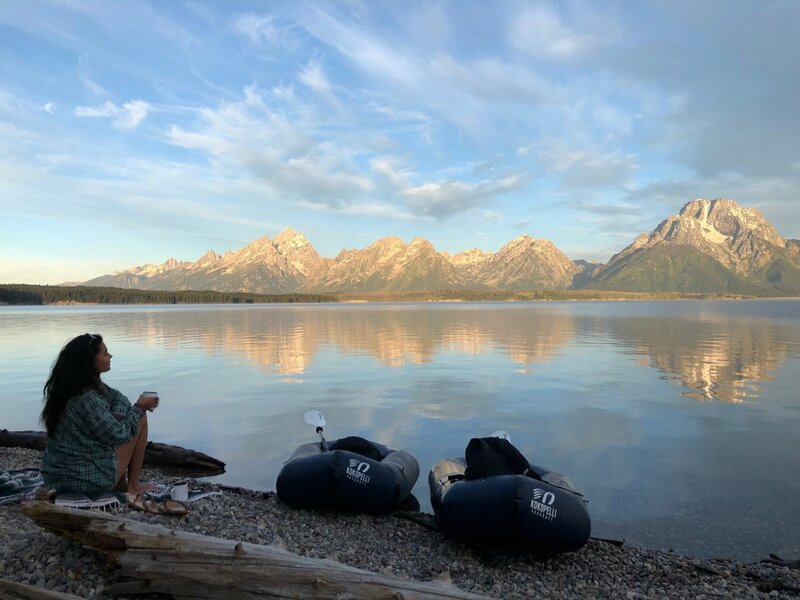 So we decided to only pack one raft for this trip to make room for more drinking water in my backpack, but we regretted the decision once we made it to the top of the trail where we were met with amazing views of the lake and an up-close encounter with the Tetons. After such an intense hike, we both treated ourselves by jumping into the icy alpine waters and then getting out onto the water to cross the lake to the snow that still lingers at the 9,129ft elevation. The water was maybe about 45 degrees, so jumping into the water alone felt like pins and needles, but even sitting in the dry comfort of the raft kept your toes and bum an icy temperature. We enjoyed lunch up here on the large boulders along the lakeshore and let a few of our friends try out our raft before beginning our descent down the trail. The Delta Lake was one of the most fun and challenging hikes to bring the rafts on, and I think we are hooked on always packing these rafts with us on the trails. You can’t beat being the only ones (minus our friends in their blow-up Intertubes) out on the water in such a beautiful area!